Our first meet of the year and our AGM weekend. 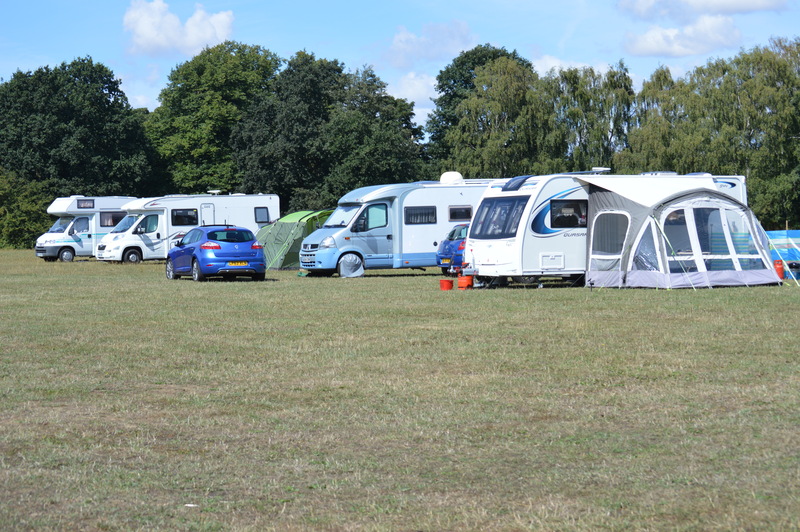 The section got the new camping season off to a flying start with this meet at CHADS. All hardstanding and a cosy hall are the key requirements for early or late season meets. 18 units braved the high winds on Friday and settled into the weekend with games, crafts and general natter in the afternoon followed by Irish Stew provided by Brian and Marlene – there was enough to feed the 5000 and it came out again for lunch before the AGM. The evening then followed with some good dancing and spots. When Saturday dawned, it was even more windy but this didn’t matter. Once again, a relaxing morning in the hall with everyone doing a variety of activities. The AGM and Members’ Meeting were dealt with just over 1 hour in the afternoon – allowing more ‘cosy time’ in the hall – with the rain now hammering on the windows. An American supper was shared followed by a St Patrick’s Day themed evening with green costumes and an Irish flavour to many of the spots. All too soon, it was time to close the evening and off to bed. Sunday arrived sunny and bracing (some would say cold) – but at least the rain had gone away. Brian provided his Breakfast Baps which was followed by a final tea / coffee before making our way home. Thanks Brian. 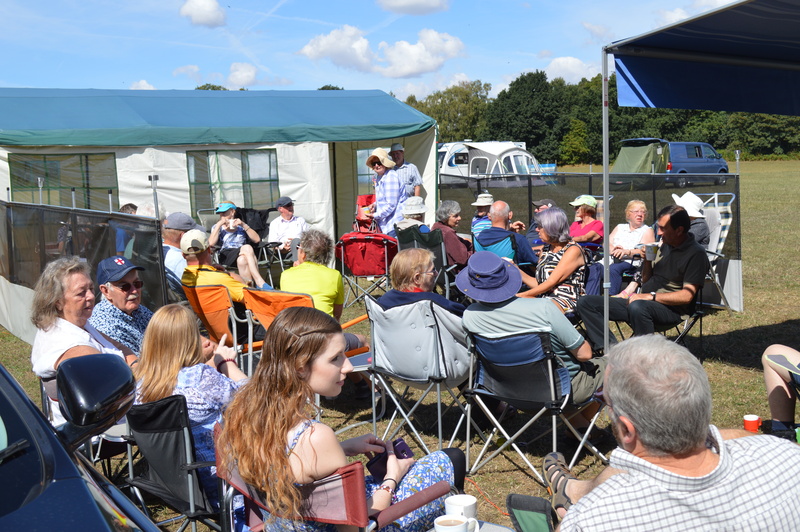 It was a lovely weekend and thanks to all those who helped to make it a success by either just coming along or actively participating in activities. 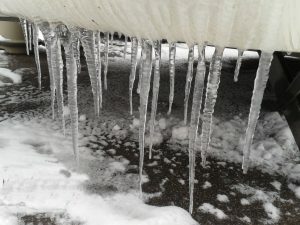 Unfortunately, the social was cancelled due to a forecast of wide-spread freezing rain and black-ice. Despite late cancellations, again, we’ve achieved a fully booked Meet (having a couple families ‘waiting in the wings’) in this pretty oasis of a nature reserve. Every time we come here we discover something new and the ‘cosy’ feel of the hall adds to a great weekend at the end of our camping season. 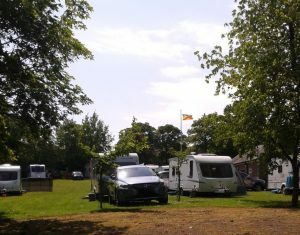 During this weekend, there have been games, dancing, music, great callers and spots, plus free soup laid on when we all arrived. A fish and chip supper, at a discount price, provided on the Saturday, was enjoyed with puddings lovingly made by members and Brian & Marlene’s famous egg and bacon baps provided sustenance before we left on Sunday – There was no need to eat much in November! A couple of visitors who have come with us occasionally in the past, told me that they were made so welcome here that they were going to support us and join our section – this was such a nice thing to hear! So that brings me to the end of my little account of our Halloween Meet and just to say that we look forward to the exciting programme we have for 2019 with some fresh locations put into our 2019 programme by our new Site’s Officer. 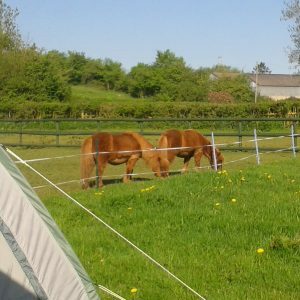 Four of us arrived early to set up camp, our famous ‘corral’, this time enhanced by 2 camp tents fixed to make a community area for our coffee mornings etc. and Rummicub tournament. 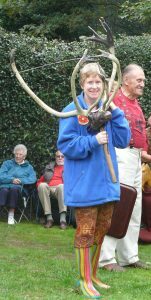 Well, we shouldn’t have stopped for coffee before we started – this delayed the procedure quite a bit but eventually everything was ready for this special weekend when the village of Abbots Bromley celebrated their horn dance. 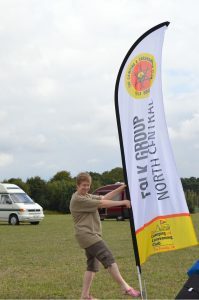 We made full use of the tent as the weather was a bit damp but not our spirits – we had a good turn out and it was very nice to welcome our members and visitors alike. 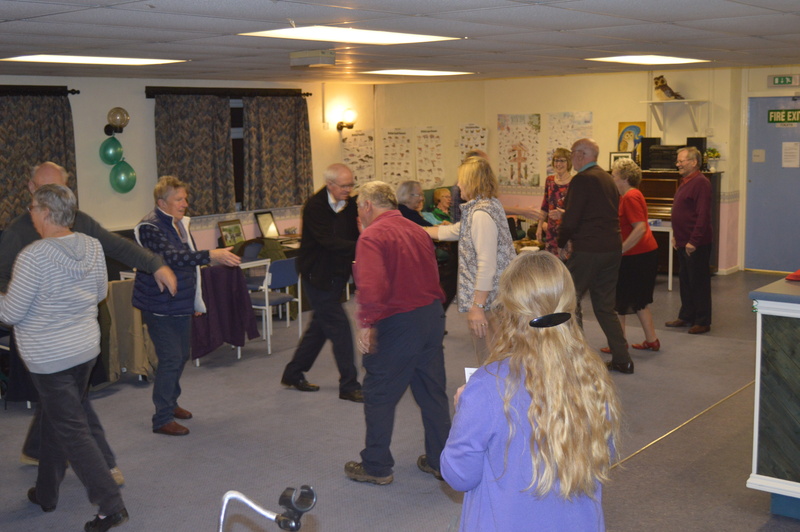 We did start off on the first evening with a games night and the following two nights, dancing, music and good fun were had at the village hall. We had been invited to the farm for the arrival of the horn dancers on the Monday and one of our members joined in with their traditional dance. Our group did some demonstration dancing on the lawn and were able to do it without the rain this year! Brian and Marlene, again, treated us to hotpot and on another day, their famous bacon baps – we will have to keep going with the dancing – other than that we will have to take up going to the gym – I know which I’d prefer to do! 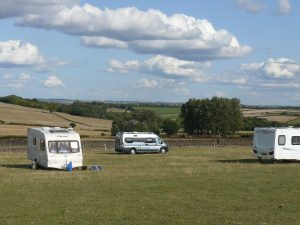 We were back at Barlow for an end of summer holiday meet. This is somewhere we really look forward to going with a scenic view across from the rally field. It took us 2 hours to get to Barlow – or it would have done if the traffic had been less busy and I hadn’t got lost in Tesco! That comes of my husband suggesting we met at the clothes section, leaving me there and then (in such a big store) I found it difficult to find my way out – that was my excuse! At last we arrived and were made very welcome by our faithful stewards, Brian and Marlene. We were glad of a quiet evening after our travels and, after which, we were ready for a busy weekend of homemade fun and entertainment. The weather was mixed but at least we weren’t struggling to shelter from the hot sun, as had been the case on the previous few meets. We enjoyed coffee mornings under the canopies of a couple of our units – one morning the heavens opened – which was very cosy. 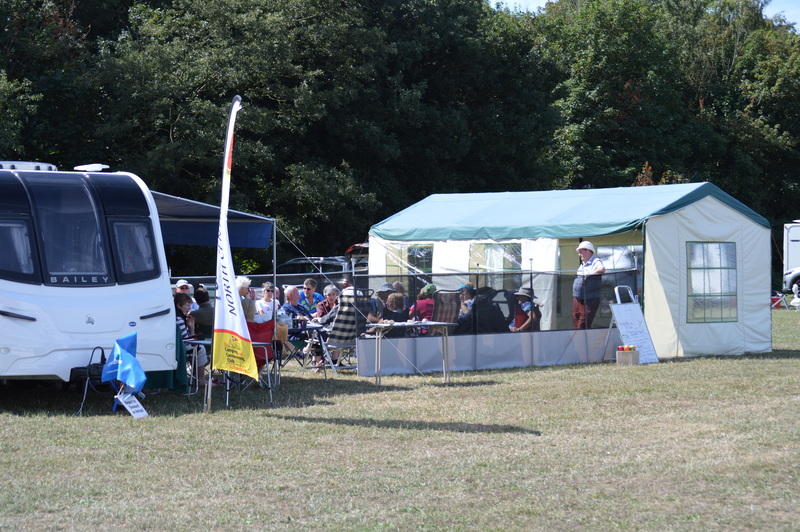 We made a corral with caravan and motorhome, surrounded by windshields, and used this space for the gathering of all our members and visitors over the weekend. This was especially useful on the Sunday morning when Brian and Marlene (with apprentice Richard) treated us to the North Central Breakfast Baps. The evenings were filled, as usual, with music and fun – it was so nice to be able to form a band with friends who renewed their acquaintanceship this weekend. Again, we were lucky enough to have talented musicians, callers, spots and dancers. On the Monday some of us got up early and visited the car boot sale in the field next to us, even though some of the traders had been put off by the rain the day before. That evening, for those who managed to stay that night, a delicious beef & vegetable hotpot was produced by Brian, then a tray of sumptuous cakes, followed by an introduction to Rummicub for those remaining or who could bend, after their meal, to reach the game table! 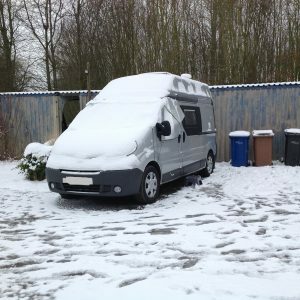 Oh well, the goodbyes were said and it was home to sort out the vans etc. and repack for the next adventure! 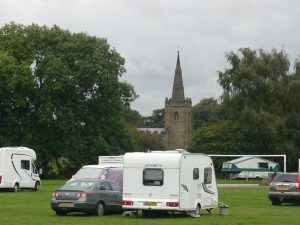 I must report back on a fantastic long weekend at Thoresby with a very good turn-out! This site is surrounded by countryside and the most magnificent hotel, leading down to a river meandering around the perimeter of the grounds. Some people set off on their bikes to explore the quiet roads etc. 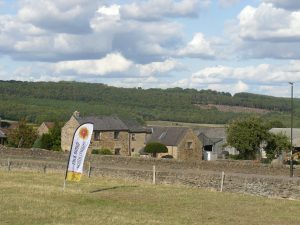 around the estate and beyond – we were too busy with activities on site! We arrived and, after setting up, were provided with a delicious pasta meal and soup – in fact, Brian and Marlene provided so many pasta shells we could have fed the hotel guests as well! We had a sing-around Thursday evening and an early night to prepare us for a fun-packed weekend! 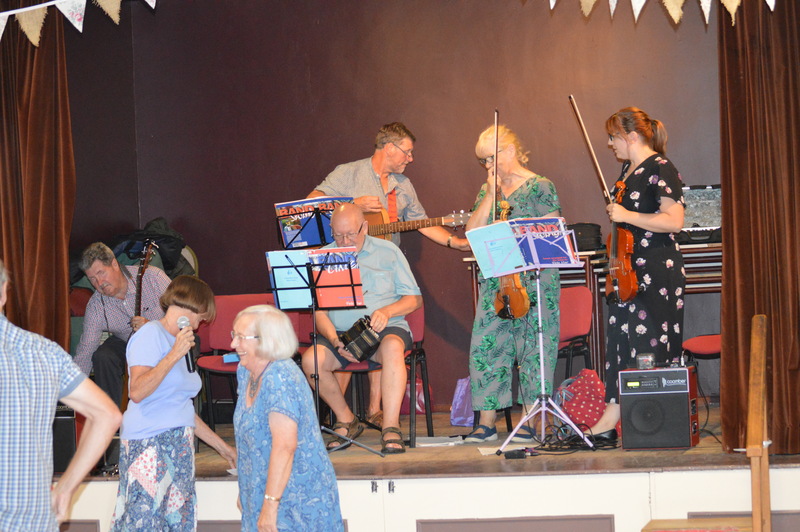 There was plenty of talent, with a very welcomed input from our guests, including a lovely group from the Ridings, who created a band for us on the Saturday evening. One of the surprises of the event was a man from ‘Worksop’ who bowled us over with his self-written monologues – no one will forget the “F’F’F’ Flat-pack Furniture”. It was lovely how we all gelled with our visitors – which is always the case – everyone is so friendly. One of us also made friends with a man from the Morris car Club, after enjoying the Morris car rally and brass band, and here’s hoping he (and friends) will be able to join us on a future Meet. Brian and Marlene came up trumps again on Sunday morning with their ‘breakfast baps’ – as it was so cosy, sheltering from the drizzle, we all sat inside our big yellow and green tent to eat them. In fact, the weather was warm mostly and the rain tended to come at night, allowing a few of us to play ‘Kubb’ on the field a couple times. 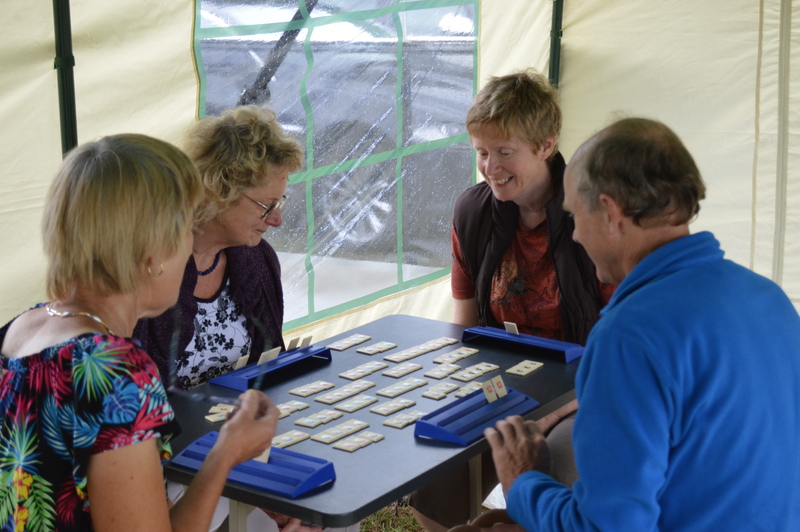 We also enjoyed a few games of Rummikub, which is addictive! The best was yet to come for those who managed to stay for the last evening, with some energetic dances and yes, a reward of chocolate biscuits! Sheila and David stewarded, with Colin and Sylvia, who stepped in while Sheila and David went to the shows. The weather was mostly sunny and warm. The views were magnificent and Sheila said that you could see Cardigan Island – nature reserve from the site. There were 4 mules (who were used for pulling logs out of the woods) and 3 horses at the farm and those who stayed there enjoyed seeing these. 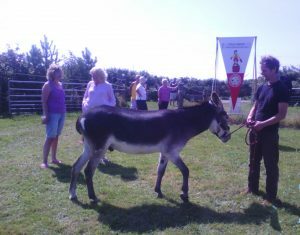 On a coffee morning they were very pleased to have the pleasure of Chico the Donkey who had walked the perimeter of WALES. The campers who had been on a boat trip saw seals and dolphins swimming at the side of the boat. 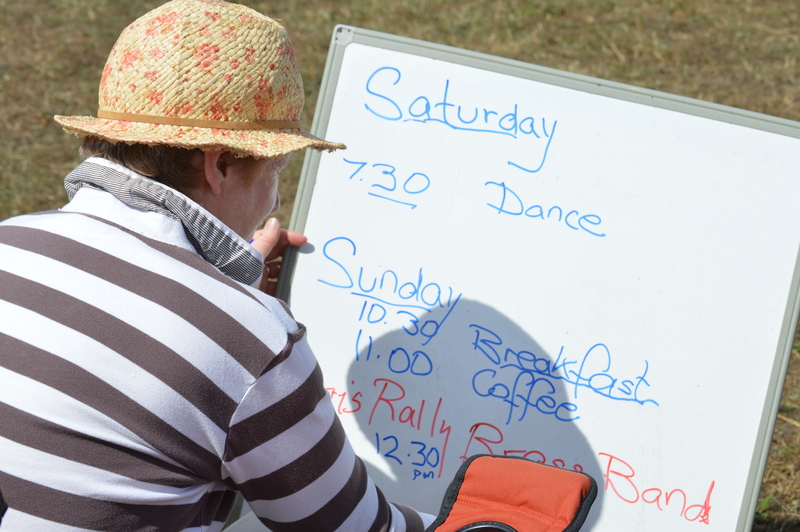 Club members went to the Cardigan Show and a little bit later went to the Nevern Show – so they had quite a busy schedule but a relaxed time in between. They also went to the Preselis Mountains where the blue stone from Stonehenge was cut. On the way to Fishguard you passed Gors Fawr, an iron age fort, with reconstructed round houses and found out about PIRATE BLACK BART, who was thought to have created the skull and crossbones flag or Jolly Roger. Members visited several beaches – Pwllgwaelod, Cwn yr Eglwys, plus Dinas Head and St. Davids. This was a very natural site with a few of us experiencing the sight of wildlife and at the entrance a beautiful horse grazing on a sparse grassy bank. The hall was very good with excellent acoustics. Our stewards, Cindy and Clive, made us very welcome, as usual, and provided delicious cakes – no good for those of us on a diet! We all caught up with our news and some played board games, while others did a bit of painting. Some people went walking – such a nice area. The dancing was great fun and we were entertained with brilliant talent! Everyone worked to make this weekend a success as are all our Meets organised by such a hard working club. This has been a very successful Bank Holiday weekend with a very full turnout! 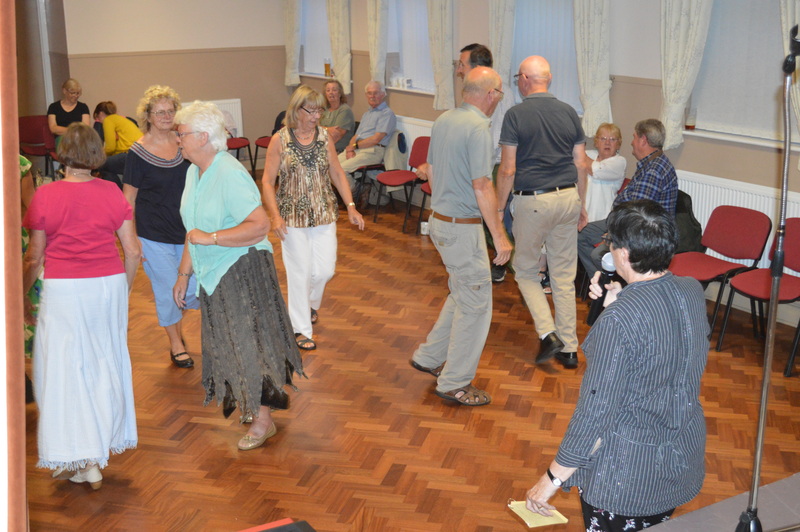 As well as regular attendees, we had several new people turn up and also welcomed visitors (from the Netherlands), who were staying locally, to our evening ceilidhs. Thank you to members with expertise who support less experienced members when performing a song, instrument etc. This is the way we all learn, gain confidence and progress so that skills can be passed on, plus have a lot of fun. At one point we had a group of scouts arrive quite a quick fleeting visit! Music and games were enjoyed on the field – what a pleasant way to spend the day! 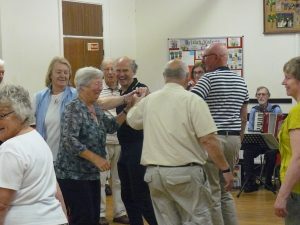 As usual, we have had plenty of dancing and spots – we are so lucky to have such talented musicians and callers in our club – on Saturday night it looked like we could have gone on until midnight! A big request was for, which is becoming a tradition, Swing Low, Sweet Chariot – with actions! 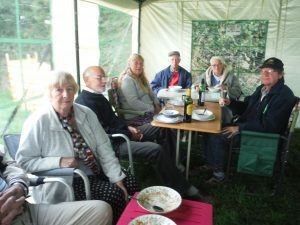 The weather has been fantastic and we all settled down to a delicious shared supper on Saturday. The stewards worked very hard (this is rewarding as well!) at this popular Meet – thank you! We thank the Midlands for their invite and hope that they will be able to attend Seagrave with us next year, where we hope to reciprocate your warm welcome. 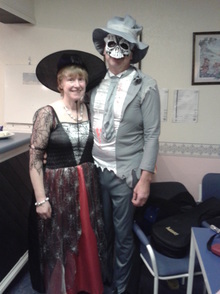 Those who managed to attend this Midland Meet had a lovely time, were lucky with the weather and a couple of our members even managed to win the fancy dress. The alfresco coffee mornings were very popular and much appreciated. It is so good to go to other groups (a couple of us even visited the South West group) and be made to feel like family. 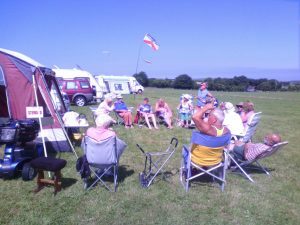 This was an important Meet with our AGM, which went smoothly, but this didn’t take up a lot of the members – we even persuaded a couple more people to join the committee, leaving some people free to explore the area etc. 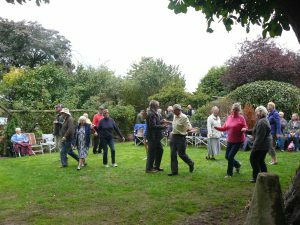 Again, this was another great gathering with music, dancing and various spots – great home grown entertainment! We laughed until we couldn’t stop and enjoyed a good chat. There were cakes-a-plenty and a wonderful atmosphere. A big thank you to the Stewards for being brilliant hosts. CHADS has been a fantastic start to our 2018 Meets – we have just got home and I couldn’t wait to write about this wonderful weekend! A few of us nearly didn’t go through illness or other commitments but fortunately most of us made it! We miss those of you who could not come or broke down on the way! Again, we were not full but those who did attend threw themselves into the spirit of all that went on, including a St. Patrick’s Dance where green balloons decorated the room and people in green costumes made us laugh! 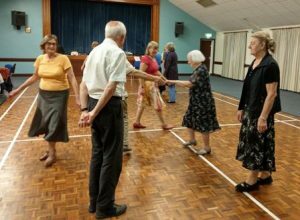 We actually had 2 dances, ‘spots’, workshops, indoor bowling, quiz sheets and table games during the weekend – it was hard to fit it all in! If it hadn’t been so cold outside (it was so warm, friendly and cosy inside!) 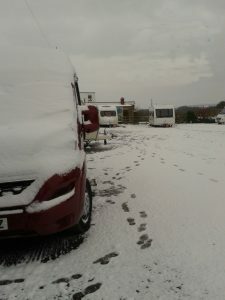 we would have had a snowman competition – one member did venture out in her dressing gown – I’ve seen the photo! Some unfortunate members had to (‘tough’ hardy dog owners) brave the snow storms and arctic winds to give their little treasures their daily exercise around the convenient nature reserve! The stewards supplied us with boxes of delicious cakes – better than on any cruise ship! We had an American Supper where we all shared our meal, including a very hot, tasty soup – enough for everyone, and this added to a ‘family’ type atmosphere! At the end of the Saturday dance a member who used to run the group a few years, and who has not been able to join in for a long time, stood up and told us all he was so pleased to see the Group thriving, learning new dances, having such a lovely time and also said how much N. Central had grown in numbers since a low point at one stage when he was involved. We think there is a lot of enthusiasm, talent, good callers and keen dancers within our section and hope, with help and leadership, this will all blend together to make a sound basis to lead us through the year and onwards! DOVERIDGE’s Tea Dance was a very good start to 2018! Thank you to all those who worked so hard to make this a success! Although not big in numbers, mainly due to illness and bad weather, the people who did come really enjoyed themselves with energetic dancing and great ‘spots’ throughout the time we were there. Also, a good spread of cakes etc. were laid out during this Social and diets went out the window! Well, we all had the excuse that we danced the excess off in the hours we were there! Anyway, all in all, we had a lot of fun and caught up with any news of what we had done over Christmas and the New Year; plus a few of us swopped holiday experiences and photos.